These promising practices will ensure your hospital on a university campus gets the protective measures it needs. Medical centers have a wide variety of security and public safety challenges that include infant abduction prevention; managing behavioral health patients; nuclear medicine department protection; dealing with distraught visitors whose family members are gravely ill; forensic patient management; evacuation of bed-bound patients during a natural disaster; Hazmat incident management; Joint Commission and Centers for Medicare and Medicaid Services (CMS) compliance; Health Insurance Portability and Accountability Act (HIPAA) compliance, etc. The list goes on and on. 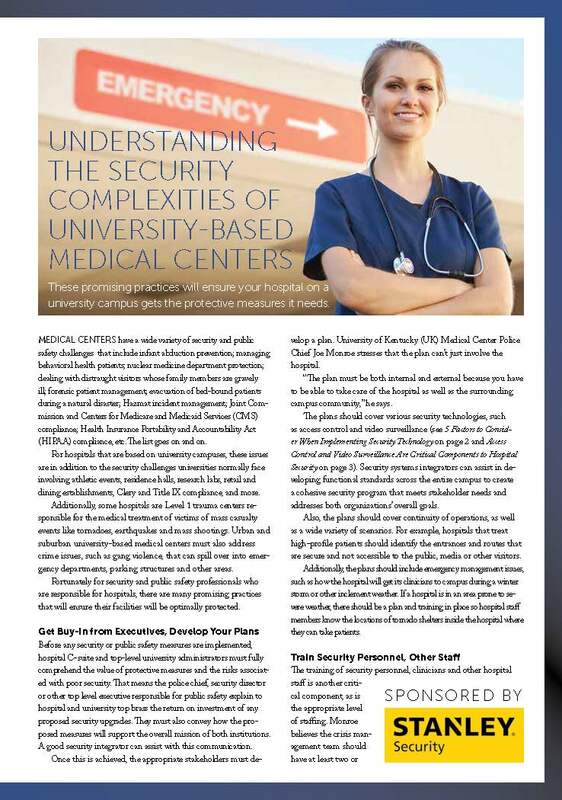 For hospitals that are based on university campuses, these issues are in addition to the security challenges universities normally face involving athletic events, residence halls, research labs, retail and dining establishments, Clery and Title IX compliance, and more. This article reviews practices that will ensure your hospital on a university campus gets the protective measures it needs.